Meet the characters: Cecilia and Tommy: Two best friends who live on the wrong side of the tracks with crumbled lives and neglectful parents. They think running away from home will make things easier. They never imagined what they had in store. Can their friendship stand the test of Seven? Greg: He wakes up in the morning with a fresh cup of coffee, goes to work, comes home, goes to sleep, wakes up to another fresh cup of coffee, goes to work, comes home, and goes to bed. When his rote and monotonous life slowly starts to unravel, Greg, the puzzle solving lawyer, falls apart. Will be unravel completely before Seven’s done with him? Hazel and Kale: Just two teenagers madly in love. Kale’s wanted Hazel since he first laid eyes on her. Hazel needs Kale as he is the only stability in her life, the only one that can really be there for her since her parents’ jobs are more important to than their daughter. They thought the summer would be a chance for their newfound love to blossom. Will it even have the chance to before Seven rips it apart? Kariann: Supermom leads a hectic life. When she’s not taking care of her son, Noah, she’s teaching and during the summer she works at the day care center, taking care of everyone else’s kids. It’s what she’s good at. Taking care of people. Add to that list her needy sister and newly widowed father, along with an irresponsible, pestering ex-boyfriend who happens to be Noah’s father. She’s Ms. Fix-it. But how can she possibly make anything better when she’s captured by Seven? Jonathan: Finally, there’s Jonathan. He’s dark. Clever as a snake and as temperamental as one, too. All he wanted was to be left alone. Was that too much to ask? Yes. As much as he’d like to ignore it, the self proclaimed bad boy might be the only match for Seven. When seven strangers are thrown together to be pawns in a psycho’s mind game, they realize that they have to work together to reach their true potential or it could very well mean their death. Seven strangers. Seven stories. One chance to not only saves their lives, but to change them in ways they’d never even imagined possible. Frankly speaking, I love how the book was written. At first, I thought the book will be boring because I expected that it would be difficult to relate seven strangers together and make them as the center of the story attraction. But I was proven wrong. Even though it may be not the best book ever written, I kind of impressed with the young author. I've read her "Starless Sky' last year and like it very much. Like her previous book, Agnew put an intense storyline, a little of mysteries as well as suspense. The best part of all, the twist and turn of the story because I think the book also is a psychology thriller, which is a genre that I like. But at some points, I have to admit that I lost my interest because of too much elaborating on certain parts, as I think the part should not be included and without it, the story would be just great too. Nonetheless, you should not give up to keep reading it. The book has something promising and I was overwhelmed by it. Like I said earlier, the book maybe not the best written ever, but when a 17 years old teenager wrote it with a great intense, made a complicated story with a simple twist, that must be something cool about the author, and the book. Two thumbs up! Darlyn, you say comments are like teddy hugs. Well your reviews are like teddy hugs. Thanks so much for your feedback on Seven. 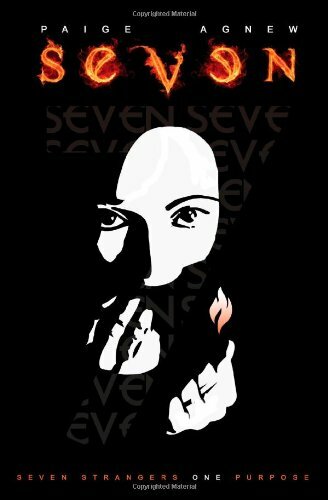 Your followers can win a copy by "liking" Seven on facebook at http://www.facebook.com/pages/Seven/260637773962082. Looks like a great Halloween read.